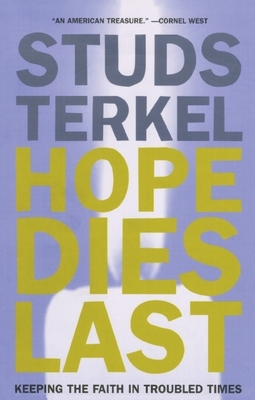 Hope Dies Last is Studs Terkel's inspiring new oral history of social action in America. An alternative, more personal history of the "American century," Hope Dies Last forms a legacy of the indefatigable spirit that Studs has always embodied, and an inheritance for those who, by taking a stand, are making concrete the dreams of today. For Terkel, these interviews represent a change that has taken place in the last few years of uncertainty in America. From a doctor who teaches his young students compassion, to the now-retired brigadier general who flew the Enola Gay over Hiroshima, these interviews tell us much about the power of the American dream and the force of individuals who hope for a better world. Terkel's subjects express with grace and warmth their secret hopes and dreams, combining to tell an inspiring story of optimism and persistence that resonates with the eloquence of conviction. Studs Terkel is the author of eleven books of oral history. He is a member of the Academy of Arts and Letters, and a recipient of a Presidential National Humanities Medal, the National Book Foundation Medal for Distinguished Contribution to American Letters, a George Polk Career Award, and the National Book Critics Circle 2003 Ivan Sandrof Lifetime Achievement Award.